What are the types of environments in which youth thrive? How do we cultivate such environments to promote optimal development and positive behavior in youth? 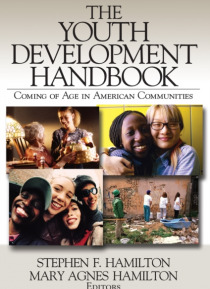 The Youth Development Handbook: Coming of Age in American Communities provides youth and development practitioners access to current theory and research in the field of youth development, including illustrations of good practice, original ca… se studies, and a contextual approach to such topics as youth participation and diversity. The Youth Development Handbook is designed for scholars and researchers in applied developmental science as well as practitioners and policy makers who implement youth development initiatives. The book is also recommended for use in graduate courses on youth development in the fields of Psychology, Human Development & Family Studies, and Education.